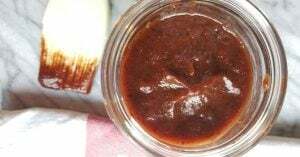 Home » Recipes » Sauces, Salsas, & Condiments » Homemade BBQ Sauce – without ketchup! Being from the South, I love BBQ’s and all the fixin’s, but it isn’t exactly the healthiest of meals. The meat is usually over-cooked and the side dishes are typically mac ‘n cheese, potato salad and cornbread – a carbohydrate explosion! 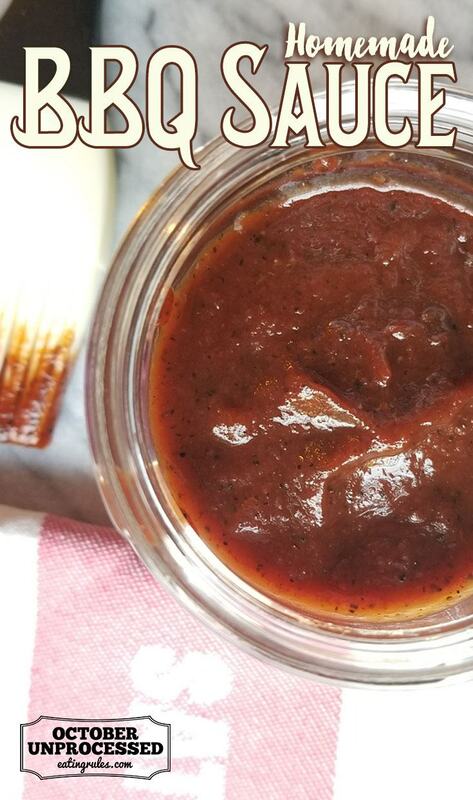 One of the worst offenders is bottled BBQ sauce. Most commercial preparations include high fructose corn syrup, food starches, and preservatives like sodium benzoate. One serving, which is typically “two tablespoons” can include as much as 18 grams of sugar — but we all use much more than that! So, I decided to come up with my own quick version that includes whole food ingredients and half the sugar…and doesn’t require any ketchup. You can ramp up the sweetness or the spiciness, according to your tastes. 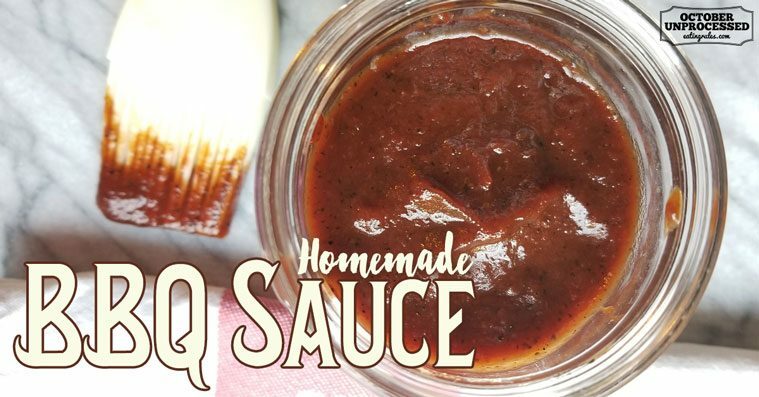 This quick BBQ sauce has half the sugar of commercial barbecue sauce, but doesn't use any ketchup! Whisk all of the ingredients over medium high heat in a saucepan. Boil for 1 minute, then reduce heat and simmer for 20 minutes. Pour into a mason jar and allow to cool. Then, seal and store in the fridge. Once opened, it will last about 3-4 weeks. 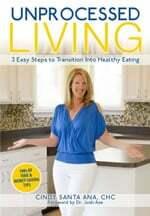 Cindy Santa Ana is an Integrative Nutrition Health Coach, speaker and author of Unprocessed Living: 3 Easy Steps to Transition Into Healthy Eating. Having lost 50 pounds herself by cutting out processed foods, Cindy now helps her clients maintain their happy weight and get back their energy by creating a personalized “roadmap to health” that suits their unique body, lifestyle, preferences, and goals. Learn more about Cindy at Unlock Better Health, and of course you can find her on Facebook, Instagram, and Pinterest. I can’t wait to try this. My grandkids love ketchup on everything. 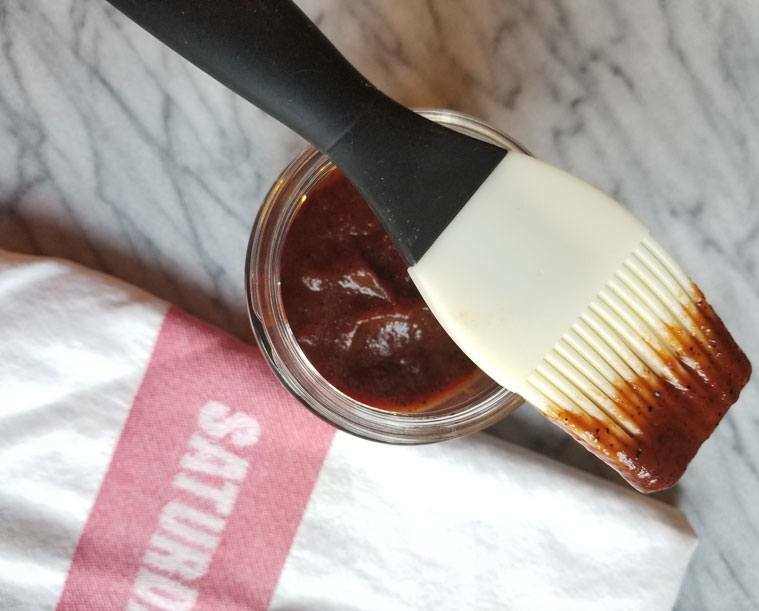 Any suggestions for tweaking this recipe into plain old ketchup? Tonight We grilled chicken breasts and basted them with the sauce just before they were done. Everyone loved them. I accidentally used 1/2 tsp of garlic, onion, and pepper. But it was still really good. I’ve experimented with not putting any sugar, molasses, honey, etc. What I have done is sauted finely chopped onion to get some sweetness into the recipe. For your recipe, 1/2 a small onion should suffice. That’s for the entire jar. This recipe makes about 2 1/2 cups. A serving would be 2 tbsp. 2 1/2 cups equals 40 tbs. each 2 tbs serving will have 5.3 grams of carbs. You could replace the mollasses with Agave syrup which will cut it down to 4.2 grams of carbs. Or, you can try my suggestion above and saute some onion to bring some natural sweetening to the barbeque sauce!